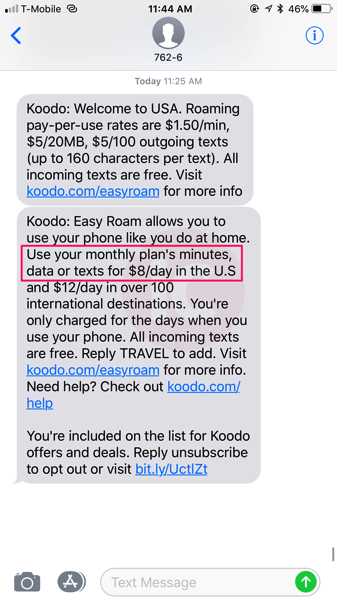 Last fall, Telus flanker brand Koodo Mobile launched Easy Roam, the company’s daily roaming feature, allowing customers to use their existing Canadian plan while travelling abroad. The price of Easy Roam was $7 per day in the U.S. and $10 per day internationally. But since the launch 10 months ago, Telus has increased prices, notifying customers via text message. The price of Easy Roam for the USA has increased by $1 to $8 per day (14% jump), while the international option increases by $2 to $12 per day (20% jump). Currently, rivals Fido and Virgin Mobile charge $7 per day for their equivalent roaming option in the USA and $12 per day internationally. Bell/Virgin increased their roaming prices earlier this year, following a similar move by Rogers/Fido. In order to subscribe to Easy Roam, customers must opt-in by replying TRAVEL to the incoming text message when they reach their travel destination, as the service is not automatic.